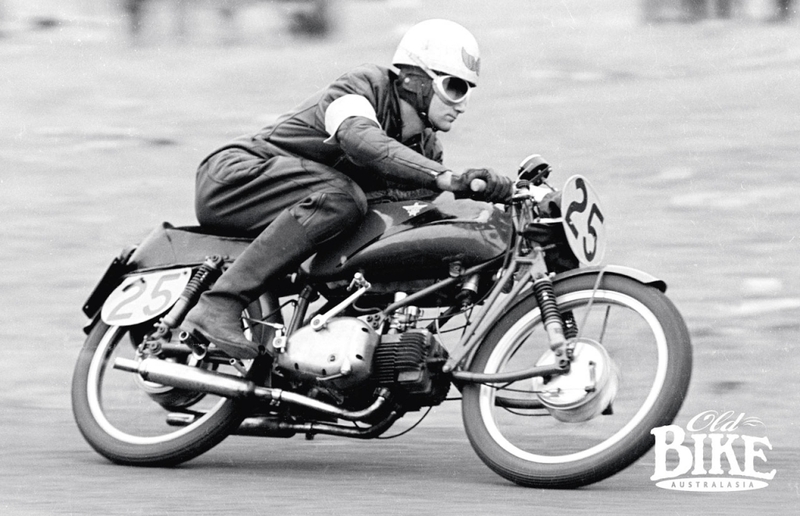 In a sea of Bantam BSAs on Victorian race tracks in the late 1950s, Ian Free’s Rumi stood out like the proverbial dog’s bits. 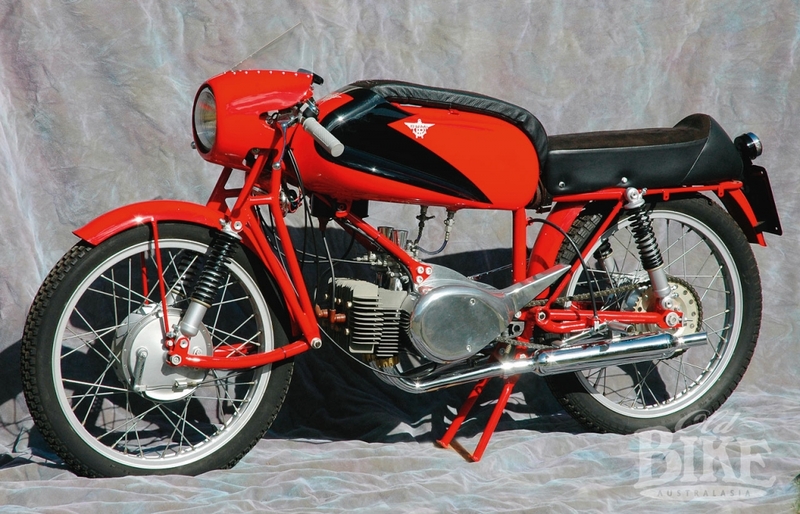 Not only was it Italian, but it was a twin-cylinder 125, something unheard of at the time. And gorgeous? This was the Gina Lollobrigida of motorcycles – all flowing curves and attention to detail. The Rumi arrived, not via an importer or agent, but in the possessions of an Italian migrant, Pasquale Delaglio, who landed in Melbourne in 1956. It had been purchased from a dealer in Ravenna, just inland from the Italian Adriatic coast in February 1956, but when Sig. Delaglio arrived at his new home in Maribyrnong he was in for a shock. His landlords, his grandparents, who operated a fruit shop in the district, absolutely refused to allow him to have the bike on the premises, let alone ride it, so the Rumi was put up for sale. He found a willing buyer in Ian Free, who took it for a ride around the block and was immediately smitten, despite the hefty price tag. At 180 pounds, the Rumi was expensive when you could have a new 250cc Jawa twin for £199 or an Adler 250 twin for £239. The Rumi concern, based at Bergamo in northern Italy, came into being as a motor cycle manufacturer in 1949, as an offshoot of a successful foundry manufacturer of cast components and knitting machinery for the textile industry. The original company, Officine Fonderie Rumi, had been founded prior to the First World War. The Second World War saw a totally different role for Rumi – as a constructor of midget two-man submarines, submarine propellers, periscopes and armaments like torpedoes. With the cessation of hostilities, Rumi began to scout around for other work, which included general engineering, making components for cameras and knitting machines, and, like other concerns in the same line of work, notably Aermacchi and MV, small motorcycles to satisfy the huge demand for cheap transport. Although a prototype (the Amisa) appeared in 1949, it was not until the following year when production began, with two models, the Turismo and the Sport, catalogued. Both used a 124.7 cc horizontal twin-cylinder piston-port two-stroke engine, with internal dimensions of 42 x 45 mm and a 180-degree crankshaft. Early versions used a three-speed gearbox which soon became a four-speeder. This basic design endured through the factory’s entire history until it ceased motorcycle production in 1962. Ian Free at Darley, 1959. The arm band signifies the capacity class in the One Hour Production Race. In 1952, two new models, the Sport and the Super-sport, appeared, the latter fitted with twin carburettors, high compression cylinder heads, and a handsome large-capacity hand-beaten aluminium fuel tank. A further redesign appeared in 1954, named the Competitizione, with the (undamped) telescopic forks replaced with leading link jobs, and swinging arm rear suspension instead of plunger. By this stage the factory was taking a very keen interest in racing, and the works five-speed models won the Italian Championship in the same year. A sports road-going version of the Competitizione, the Junior, was catalogued for 1955, with a racing-only version, the Junior Corsa, also listed. 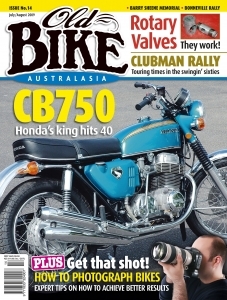 These had 10:1 compression, chromed alloy barrels and twin 22mm carburettors. Rumi also began experimenting with four strokes, initially using the two stroke unit crankcases and gearbox, with chain-driven overhead camshafts. This led to the exciting all-new 249cc Grand Prix, a DOHC gear-driven parallel twin with shaft final drive. A prototype was built and tested at Monza, and exhibited at several European shows, but never reached the production stage. Later, the same designer, Ing. 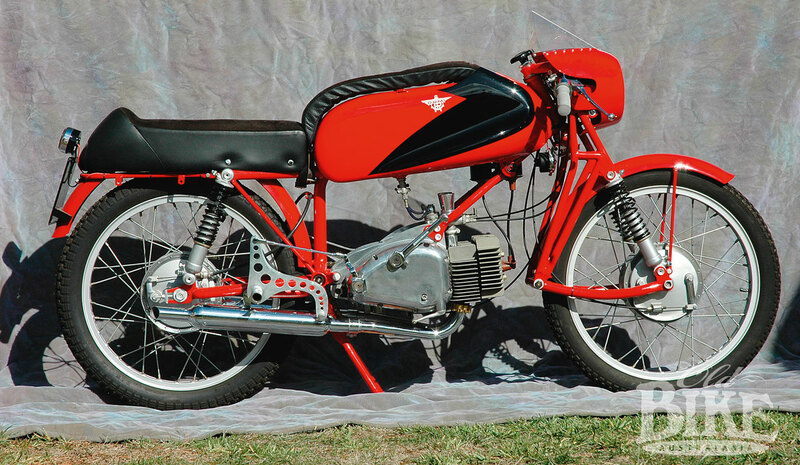 Salmaggi, produced a 125cc DOHC single with chain final drive, which again failed to make it past the prototype stage. The factory was certainly not afraid to spend money on testing its ideas in metal, for the next design was an ultra-exotic 125 DOHC four (with internal dimensions of 27 x 27.5), the engine of which once again was actually produced (and still exists) before being consigned to the too-hard basket. On the other hand, the staple two-stroke twins continued to perform well and sell in reasonable numbers. In addition to motorcycles, Rumi also produced scooters, the early Scoiattolo (Squirrel) being replaced in 1954 by the Formichino (Little Ant), which became the company’s biggest seller. Using the Rumi 125cc twin engine, the body of the Formichino was formed in cast-aluminium, with the fore and aft castings bolted to the front and rear of the engine and gearbox unit to form a rigid assembly. The rear swinging arm, chain case and silencer were also made from cast alloy. Rear suspension was by a monoblock rubber system with a leading link front fork. The Little Ant was a spirited performer, capable of trouncing most motorcycles of similar capacity, and demand led to a ‘sport’ model, the Tipo Sport, with high compression head, 22mm carburettor, and 10-inch wheels. In 1959, an even more powerful model, the Bol d’Or (named from the factory’s three-successive wins in the French endurance event in the scooter class) was introduced, with chromed alloy bores and twin 18 mm carburettors. With such a quality product it is a shame that Rumi never got completely serious about motorcycle production, and when the company was awarded a major armaments contract in 1957, it largely lost interest in two-wheelers. Few were produced after this, although there was apparently a change of heart around 1960, with an innovative 175cc v-twin doing the rounds of the European motorcycle shows. Production ceased altogether in 1962 and the Rumi company went into liquidation soon after. Donnino Rumi, son of the company’s founder, returned to his first love, as a sculptor and painter. Ian Free hustles the Rumi around Darley in 1959. Certainly the specification was impressive, with air/oil damped front and rear shock absorbers (which featured adjustable pneumatic pressure as well as 5-way adjustable oil dampening on each unit), interchangeable wheels (the front featuring a double-sided brake), and magnesium bodied Dell’Orto carburettors. Ian added a steering damper to tame the somewhat frisky handling. 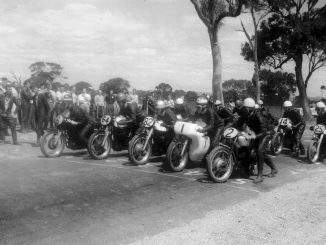 While it could not stay with the super-tuned alcohol-burning Bantams of the time, the Rumi’s reliability saw it come home third in the Up to 250cc class at the ground-breaking One Hour Race for Production Motorcycles at the Darley circuit near Bacchus Marsh in 1959. “ They had to lift me off the bike after that race”, says Ian. “The Rumi was really cramped for a person my size.” Unfortunately, Ian’s third place was stripped from him post-race when scrutineers decided that the Rumi was in fact not a genuine production machine – a moot point indeed. 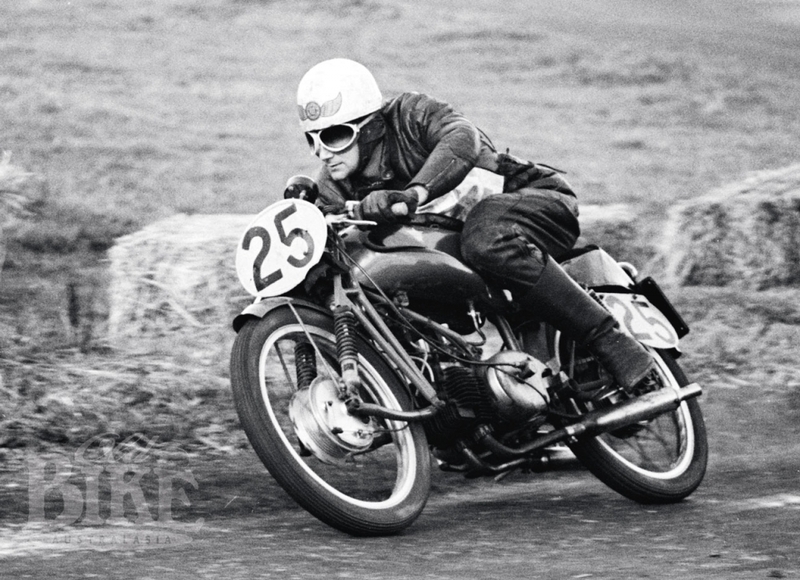 When the new Honda twins began to swamp the 125cc class in the early 1960s, the writing was on the wall for the Rumi, but Ian continued to campaign it until 1964, when it was retired from racing. For the next seven years, it served as daily ride-to-work transport, then it was stored at Ian’s Melbourne home from 1971 until 1989, when, with help and encouragement from his son Greg, the little red machine was fully restored. 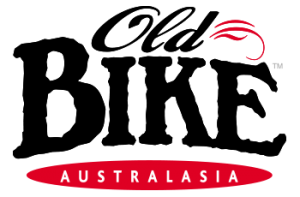 Both Ian and Greg worked for Ansett Airlines, Ian as in Building Maintenance and Greg as a sheet metal worker and welder, so various bits of the Rumi benefited from the facilities in the Ansett workshops. Around the world, Rumi owners clubs thrive, with the British and French clubs having over 100 members each, and regularly meeting for runs. The scooters in particular have a big following and are keenly sought after. Ian was approached by an interested buyer from USA a few years ago and admits he was tempted by the price offered. In the end, he simply couldn’t part with his treasured machine. Today it lives in quiet retirement after 53 years in the same hands, and is still as glamorous as ever.